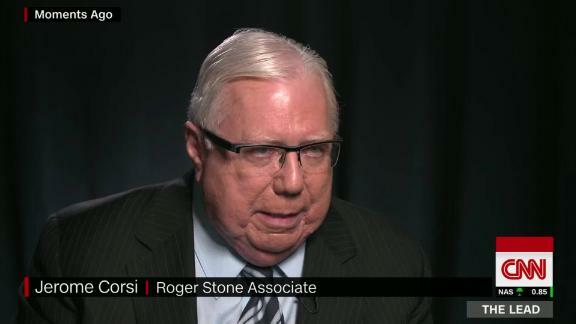 CNN's Sara Murray talked with Jerome Corsi, a Roger Stone associate who claims Stone tried to use him as a middleman between Stone and Wikileaks. The midterms are over, in the US Senate, at least. Republican Sen. Cindy Hyde-Smith won Mississippi's US Senate runoff election, defeating Democratic challenger Mike Espy. Hyde-Smith, who'd been appointed to the seat, is the first woman elected to Congress from the Magnolia State. That gives Republicans 53 seats in the Senate and Democrats 47. Hyde-Smith's win also means there will be 24 women in the Senate next year, a new record. Meanwhile in the House, the Dems picked up another seat after Xochitl Torres Small defeated Republican Yvette Herrell in a race in New Mexico. That brings the Democratic pickups to 39 seats, with one race to go. Draft court filings obtained by CNN outline significant insights into what special counsel Robert Mueller may know about Roger Stone's efforts in 2016 to seek documents from WikiLeaks. Mueller's office was preparing to tell a federal court that Stone pushed an associate to get documents from WikiLeaks -- information that is now known to be stolen from the Democrats by Russian hackers -- that could help the Trump campaign, according to a draft of a court filing and other documents shared with CNN by Stone associate and conservative author Jerome Corsi. Corsi said he got the drafts, mostly dated this month, as part of his negotiations with Mueller's team regarding a plea of making a false statement to federal investigators. According to Corsi and the documents he provided, prosecutors offered him a plea deal, which Corsi says he plans to reject because he doesn't believe he knowingly lied. The pilots of the Indonesian jet that plunged into the Java Sea last month fought to override the plane's automatic safety system right before the crash. This information comes from data retrieved from the plane's flight recorder, Indonesia's National Transportation Safety Committee said. The automatic safety system was responding to faulty data, which suggested that the nose was tilted at a higher angle than it actually was, indicating the plane was at risk of stalling. The system was forcing the plane's nose down, and the pilots repeatedly tried to manually correct this before the plane crashed, killing all 189 people on board. Ukraine President Petro Poroshenko says his country might end up in a full-scale war with Russia after a maritime clash between the two countries over the weekend. Poroshenko accused the Russians of illegally seizing three Ukrainian ships in the weekend skirmish and of building a military presence near the border with his country. Russia and Ukraine have been in a long-simmering conflict since the Russians annexed Crimea in 2014. And a conflict with Russian-backed separatists in Ukraine's eastern region has killed more than 10,000 people. A global affairs analyst explains that Ukraine is woefully unprepared to fight the Russians at sea. The planet is falling far short of the 2 degree Celsius goal to limit climate change, according to a new report from the UN. That goal, set in 2015 in the Paris Climate Agreement, would help humanity avoid the worst effects of a warming world, like massive droughts, rising sea levels and more destructive hurricanes. But the UN report says projected emissions of carbon dioxide, the primary greenhouse gas, would result in an average global temperature rise by 2100 of 3.2 degrees Celsius (5.8 degrees Fahrenheit) over pre-industrial temperatures. The report urges world governments to do more to lower their carbon dioxide emissions before it's too late. The number of Central American migrants sheltered at a sports complex in Tijuana, Mexico. That's at least three times more than its capacity. Stephen Hillenburg, the man who brought us "SpongeBob SquarePants," has died after a fight against the neurodegenerative disease ALS. Hate middle seats? Who doesn't? Then, book a flight on the passenger jet that doesn't have them. A cotton farmer in Texas is battling cancer and couldn't harvest his crop. So, his neighbors did the job for him. This "Siberian unicorn" was actually an extinct giant rhino that once walked among early humans. "In some buildings, there are more "Black Lives Matter" posters than there are actual black people." "Hopefully you won't own a car." "The word Jew was not a common insult when I went to school ... it is now." In a country still haunted by the Holocaust, anti-Semitic incidents in the classroom offer clear evidence that deep wounds haven't healed. It's the latest in CNN Digital's examination this week of anti-Semitism on the continent.